There’s some of my farmers’ market bounty, all red, green and yellow, looking like a summer flag. 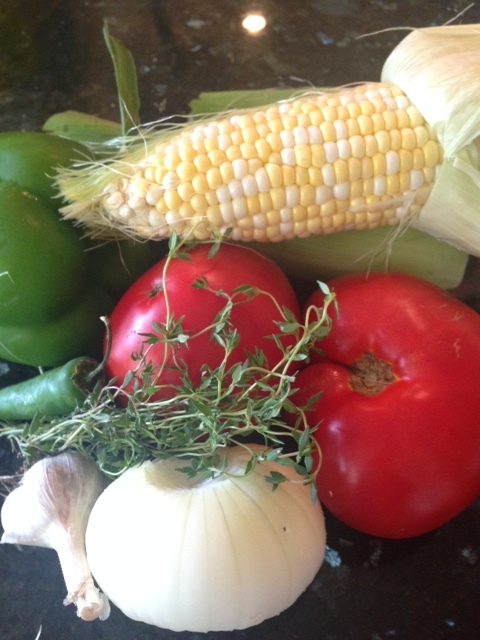 With August comes corn from our favorite Wisconsin vendor, and at last the truly sun ripened tomatoes. (As beautiful as they look, the green house tomatoes many farms offer earlier in the season never have the rich red sweetness of those sun kissed in the open field.) For several days we’re happy with the simple treat of corn on the cob boiled, grilled or roasted in its husk. Then I’m ready to cut corn off the cob and take it to another level. Corn seems to combine best with its garden sisters. In this season there’s perfection in the mix of corn, peppers and tomatoes. Nudged along with a little good bacon, a touch of fresh thyme and a zip of chili, this week day braise reminiscent of Louisiana’s Maque Choux, is good hot, cool, the next day, served as a side dish, a main meal or even warmed for breakfast topped with a poached egg. First a side note about cutting corn off the cob. Often cooks cut too deeply and include some of the tough tip cap or the part of the kernel that locks the corn seed onto the cob. For the best cut corn, use a sharp paring knife and cut through the middle of the corn kernels to release the juicy crisp tops and then scrape the cob to collect all the corn “cream”. This mix will give the best flavor and texture for the corn base. 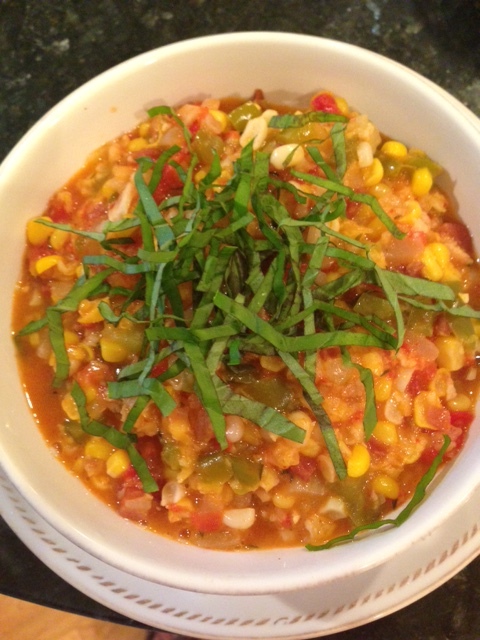 If the corn is fresh and young, the cut corn will cook in 2 minutes when added to the simmering tomato base, retaining the kernels’ pop and the succulent vegetable cream. fresh parsley or basil for garnish. You are currently browsing the Mary Jo's Kitchen blog archives for August, 2017.